The boys have access to a wide variety of board games at all times in our house and one of their favorites to play and explore with is Blokus Trigon. 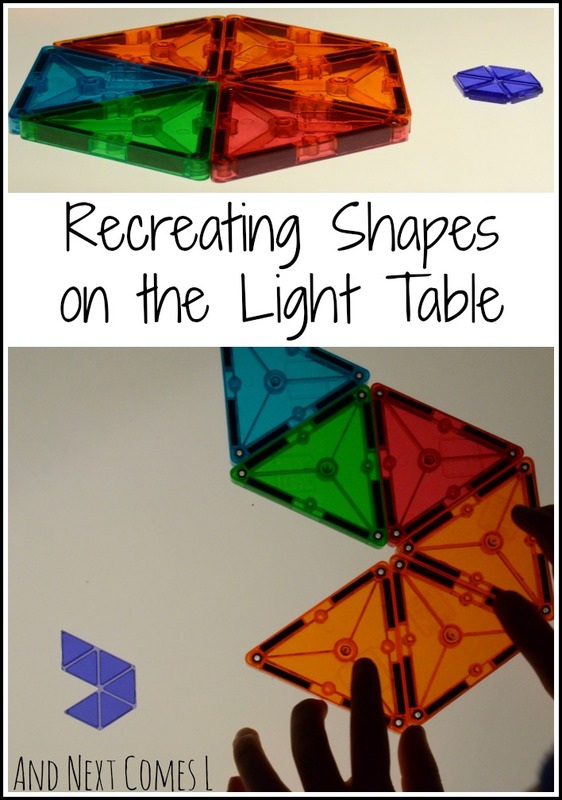 Since the pieces are transparent, they work amazing on our DIY light table. However, most of the time the boys play with the pieces on the floor or game board, creating patterns. Well, one day the boys were building with Magna-Tiles while the Blokus pieces were scattered along the floor. That's when I noticed that we could use the Magna-Tiles to build and recreate the game pieces from Blokus on the light table. Of course, the light table is optional, but it just makes everything look better. We used the triangle Magna-Tiles and some pieces from Blokus Trigon, but as I found out on Amazon, it may be hard to find this version of Blokus. However, you could easily do this activity using the regular Blokus game and square Magna-Tiles instead. Both boys loved this activity! J mastered all sorts of shapes, including some of the more complex shapes. K only focused on one shape, over and over: the hexagon. And when he was done, K held it up to show it off. J thought it was a cool idea to pick up the shapes once they were made, so he also made a hexagon to show off. Ta-da! If you do not have Magna-Tiles yet, then I really urge you to try them out. My boys have not stopped playing with them since the day that I purchased them. Fun!! I've never seen that game before but I love how you used the pieces! The magna tiles look so pretty! I'm planning to pick some up next month! DOOOOOO IT! Magna-Tiles are awesome!